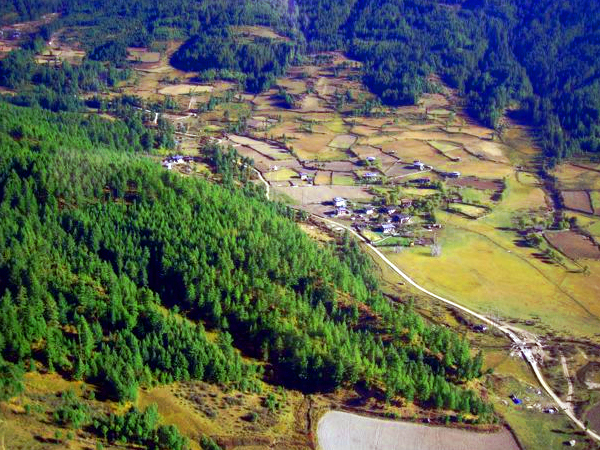 There are four valleys in Bumthang: Chhumey, Choekor (the location of Jakar), Tang and Ura. Chumey is the first valley you approach from western Bhutan. Upon decent from Yotongla pass, first you will see a small roadside temple of Cuchi at Gaytsa. Gaytsa plain and fields are also nesting grounds for some of the migratory birds including Black-necked crane. On the slopes above Gaytsa is Buli temple, which has small number of Monks. Higher up along the ridge, you can see red-roofs of Tharpaling Goemba, founded by popular Dzongchen master and philosopher Longchen Rabjampa in 14th century. On the right side of the valley, you will see a large building of Domkhar Trashicholing Dzong, once the summer residence of 2nd King Jigme Wangchuk. From Domkhar village, you will see a small settlement of Chhume with large schools along the road side. Then you will pass a small hydro-power plant and reach Zungney village, which is now a days is a popular tourist stop to see Yathra weaving (deep colored wool textile). You can see the weavers at work here and shop for textiles. On a promontory, on the opposite side of the river is seen a three-storey Prakar Goemba monastery. Higher up on the hill above the Praker, which takes around good 20 minutes in Nimalung Monastery. Chumey is located in Bumthang district of Bhutan. The southern part of Bhutan is tropical, and in general the east of Bhutan is warmer than the west of the country. 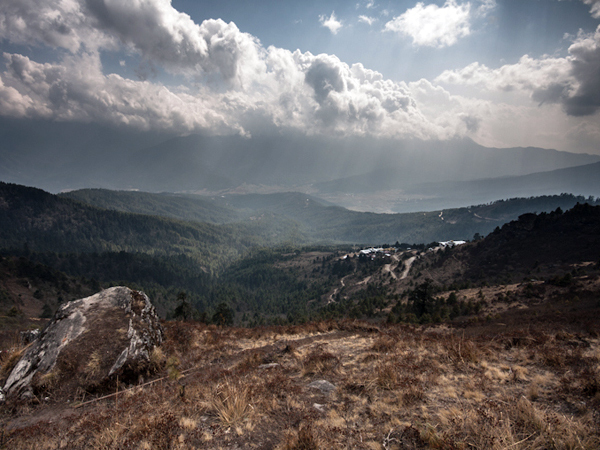 The central valley of Punakha, Wangduephodrang, Mongar, Trashigang and Lhuntshi enjoys a semi tropical climate with very cool winters, while Thimphu, Tongsa and Bumthang have a temperate climate with monsoon rains in the summer (22- 28-degree Celsius approx.) with snow-fall in winter. Winter (below 0 – 8 Degree Celsius approx.) The best time to visit Bhutan is from mid-November until mid-March, at this time of year the climate is dry, with daytime temperature of 16-19 degrees centigrade and normally sunshine and clear skies, nighttime temperatures can fall tol below zero. The monsoon usually arrives in mid-June, with the rain falling mainly in the afternoons and evenings. At the end of September, after the last of the heavy rains, autumn (warm days but nights are chilly; 17-27 D. Celsius approx. )and a magnificent season for trekking unfolds lasting until mid-November. Generally spring is warm (20 – 25 Degrees Celsius approx. ).